Question: "Why do seminarians wear the cassock?" Seminaries are a relatively recent thing in Church history. The first seminaries were established in the wake of the Roman Catholic Counter-Reformation in the 16th century, and were only later adopted as a model by both Orthodox and Protestants. The first Orthodox Seminary was the Kiev Theological Academy, which was founded in 1615, on the grounds of the Theophany Monastery. Perhaps because of this historical connection of Orthodox seminaries with monasteries the practice is for Orthodox Seminarians to wear a cassock and a monastic belt, just as would a novice monastic. "Being a theological school, Holy Trinity Orthodox Seminary is guided in its activities by canon law. In accordance with the canons and decisions of the Orthodox Church, all inhabitants of the monastery are obligated to be in obedience to the Abbot. Students enter the theological seminary wearing cassocks and belts like novices in the monastery but with a specially modified regime. Therefore they are obliged to submit to the seminary and monastery authorities according to the dictates of their consciences and Christian obedience which call for humility and respect for spiritual superiors. Students must be clearly aware of these things and must consider beforehand whether they are really inspired by an Orthodox Christian attitude, and whether it makes sense for them to study in the Seminary under such conditions." Most seminaries are still connected with monasteries, and participation in the liturgical life of the monastery is one of the more important aspects of an Orthodox seminary education. "The normal custom vis-a-vis cassocks varies between the Byzantine and Russian traditions. In general terms, and largely common to both traditions, the inner cassock (in Russian the подрясник) is to be worn by all persons in tonsure - that is, by all those of the higher orders of the clergy (bishops, priests, deacons), all those of the lesser orders (subdeacons and readers), as well as by monastics, and often (though not always) by seminarians. It is fundamentally a sign both of the obedience of the tonsure (in the cases of all but seminarians), and of self-effacement. In proper terms, no person in any of these categories should be in the church without being attired properly in the подрясник. In the Russian tradition, it is the more formal outer garment of bishops, priests, deacons and monastics (of the rank of ryassophor, named specifically for the wearing of this garment, which is in origin monastic), worn over (not instead of) the cassock. The ряса is not normally worn by subdeacons or readers, and never by seminarians. In normal Russian practice, one receives a blessing to wear the ряса either on ordination to the diaconate, or when advancing in the monastic life. In the Byzantine tradition, the same general practice often applies; however, it is common for readers to wear this outer garment when reading in church (usually without the cassock beneath, unique to Byzantine practice) - and in some cases others also will wear the ryassa in the same manner (choir directors, etc)." (March 30, 2007). Question: "Why does our parish not do all of the anaphora prayers out loud?" The quick answer to this question is because our bishop, the service books, the Typikon and the unbroken Tradition of the Church all agree that we should do it the way we do. "In one liturgical tradition after another, the modern Liturgical Movement has swept aside the age-old custom of reciting at least certain liturgical prayers, especially the most solemn prayer of the eucharistic anaphora, in secret" ("Was the Eucharistic Anaphora Recited Secretly or Aloud? The Ancient Tradition and What Became of It" in Worship Traditions in Armenia and the Neighboring Christian East, ed. Roberta R. Ervine, AVANT Series, Book 3, St. Nerses Armenian Seminary, New Rochelle, NY (Crestwood, NY: St. Vladimir Seminary Press, 2006), p. 15). And he says that like it is a good thing. He is celebrating the fact that in the Roman Catholic Church as a whole, and in many of the ancient Churches, including some in the Orthodox Church, there has been a movement to do all or almost all of these prayers aloud. But he acknowledges in doing so, that prior to the 20th century, the universal practice of every ancient Church had been to do these prayers "secretly". What do we mean by "Secret"? Before we go any further, we should clarify what we mean by "secretly". There are many prayers that a priest does aloud; but there are prayers that the service books say, and Tradition instructs, that the priest should say them with a relatively quiet voice. Depending on the size of a church building, how many are present, and whether the choir sometimes finishes singing before the priest has finished these prayers, you either may never hear any of these prayers at all, if you are standing with the faithful, or you may occasionally hear at least part of these prayers.These prayers are typically said in something louder than a whisper, but not in way intended to be easily heard by all. "And already some of their neighbors and friends and business associates had taken some of them aside privately and were pledging to protect them and to exert more earnest efforts for their assistance" (3rd Maccabees 3:10 NRSV). "Even now neighbors, friends and co-workers were quietly drawing some aside, assuring them that they would support them and do the utmost to help them" (3rd Maccabees 3:10 NETS). In context, these are people who had good reason to fear what they said might be overheard by others, and so would have been speaking in something close to whispers. Could the Entire Church be Wrong for Most of its History? Robert Taft tries to make the argument that in the early Church, these prayers were said aloud, and so this, along with the supposed benefits of the people being able to hear these prayers, justifies changing what he acknowledges to have been the universal Christian practice. First off, I don't believe he is correct, but before we get into that, let's assume, for the sake of argument, that he is correct about the practice of the early Church. Would that mean that we should revert to that practice? There have been changes in liturgical practice over time as the Church has adjusted to new circumstances, and many of these are related to the decline of the strict discipline of the Church after the age of the early persecutions of the Church, and so it is not inconceivable that if there was such a change, this might have been the reason for it (See: Liturgical Fossils). Few would want to go back to a system in which people who had sinned seriously had to stand outside the Church and ask for those who entered to pray for them. Cherry picking the practices from the early Church that you may like is Jurassic Park Liturgics, and contrary to a sound Orthodox mindset. The key question here is whether or not you actually believe that the Holy Spirit guides the Church. It is certainly possible that portions of the Church can fall into error. It has happened many times in Church history. But if you believe that the practice of saying the anaphora prayers secretly is an error, you are arguing that the entire Church fell into error at the most significant point of its most significant worship service. This is something that a right believing Orthodox Christian cannot agree with (See: Are the Ecumenical Councils Infallible?). Not only do the traditional service books of the Church universally instruct the clergy to say certain prayers secretly, but the Typikon likewise instructs the clergy to do so (see, for example, Chapter 2 of the Typikon (which gives the general rubrics for serving Vespers) which instructs the priest to say certain prayers secretly at several points in the service). Even the Ecumenical Canons of the Church make reference to secret prayers (See Canon 19 of Laodicea). What was the Practice of the Early Church? "Actually, we do not have any clear statement on the question in the patristic period. The arguments which people seem to think furnish proof for the fact of the recitation aloud of the Eucharist in antiquity, are generally merely inferences drawn from the importance attached by the Fathers to the people's final "Amen." But at least for twelve centuries in the West, and for still more in certain regions at least of the East, the people gave this "Amen" in response to a few words uttered aloud by the priest in concluding, and they never seems to have been concerned about hearing or even knowing exactly what he might have said previously and inaudibly for their sake" (Louis Bouye, Eucharist: Theology and Spirituality of the Eucharistic Prayer, Charles Underhill Quinn, trans, (South Bend, IN: University of Notre Dame Press, 1968, p. 367). Robert Taft talks at length about the fact that it was uncommon in ancient times for people to read without reading audibly, but this really proves nothing. These prayers were not normally said without any sound whatsoever, but there were said in a much lower voice, which in a large Church, would have generally been inaudible to most of the people. This does not mean that in a small Church, people would have not been able to hear at least some of these prayers. Even today, in Churches that still follow this practice, there are often times when the choir has finished singing, and the people are able to hear portions of these prayers. The most compelling piece of evidence that Robert Taft cites is from the Life of St. Melania the Younger, who reposed in 439 a.d., and on the day of her death a priest celebrated the liturgy at her request, and it says that while the priest was serving, in great grief, he was unable to speak up, and when St. Melania did not hear the epiclesis, she called out to him "Raise your voice so that I will hear the epiclesis" (Taft, p. 34). But this hardly proves the case here. For one thing, it seems unlikely that this was served in a large cathedral with many people in attendance, but probably in something more like a chapel, and with few people present. I doubt that the saint would have disrupted the prayers of others by shouting out her request from a great distance. When I was a newly ordained priest, I began by serving in a relatively small room in my home, and by necessity, there was no iconostasis. It was a very intimate setting, and everyone who was present at these services heard the secret prayers that I said, even though I still said them in a lower voice than I did those prayers that are appointed to be said aloud. I am sure that this is also true in many small monastic chapels, even with an iconostasis. He also cited a story about children, who had the custom of standing near the sanctuary during the liturgy, who were found "playing Church," and recited from memory the prayers of the anaphora. But this could be explained simply because they were standing in close proximity to the clergy, and so could hear what he was saying, even though it was said in a lower voice. My archbishop says that he learned these same prayers because he held the service book for St. John of Shanghai when he was a boy, and had to know when to turn the pages for him. It's an unusual thing for a child to pick up, but if they are eager to do so, and are close enough to hear these prayers, it is possible. A law established by the Emperor St. Justinian is also cited as evidence in favor of saying these prayers aloud. though it actually demonstrates just the opposite. "We further direct that all the bishops and presbyters shall pronounce the prayers in connection with the holy Eucharist and holy baptism not silently but with a voice which may be heard by the faithful, so that the hearts of the hearers may be thereby aroused to a greater contrition and a greater praise of God." But while it is clear from this that St. Justinian was not fond of the practice, the fact that he did not refer to it as a new "abuse", but clearly speaks of it as the common practice that he is seeking to change shows that it was the practice prior to his time, and the evidence shows that it remained the practice after his time, despite this decree and threats of civil punishment for those who violated it. "Theodore of Mopsuestia's (+428) Homilies 15-16 on the eucharistic liturgy, written probably in Antioch ca. 388-392, stress repeatedly that silence is a sign of reverence. And from the summary prefaced to Homily 16, one might infer that the anaphora was recited in a low voice, since it asserts that the bishop raises his voice for the Sanctus" (Taft, p. 36). "We do not cast away the awe from our mind, but on account of the greatness of the things that are taking place, we keep it throughout the service equally, and we bow our heads both before and after we recite loudly the Sanctus, and make manifest this fear in a congruous way" (Theodore of Mopsuestia, Commentary on the Lord's Prayer, Baptism and the Eucharist (1933), trans. Alphonse Mingana, <;http://www.tertullian.org/fathers/theodore_of_mopsuestia_lordsprayer_02_text.htm>, retrieved 10-3-2017. "The priest recites quietly these prayers, and immediately after, takes the holy bread with his hands and looks towards heaven, and directs his eyes upwards. He offers a prayer of thanksgivings for these great gifts, and breaks the bread." Both Theodore of Mopsuestia and St. John Chrysostom were from Antioch, and if this was the practice that Theodore knew, we can be highly confident that this was also the practice that St. John Chrysostom knew, and so as far as I am concerned, that ought to settle the question. Furthermore, if you look at the various classic liturgical commentaries from the saints of the Church, they all speak of these prayers as being done secretly. Moreover the fact that the Nestorians and the Monophysites all followed this same practice is proof positive that this practice predates these ancient divisions. "None is worthy among them that are bound with carnal lusts and pleasures, to approach or to draw nigh, or to minister unto Thee, O King of glory, for to serve Thee is a great and fearful thing even unto the heavenly hosts themselves. Yet because of Thine ineffable and immeasurable love for mankind, without change or alteration Thou didst become man, and didst become our High Priest, and didst deliver unto us the ministry of this liturgical and bloodless sacrifice, for Thou art the Master of all. Thou alone, O Lord our God, dost rule over those in heaven and those on earth, art borne upon the throne of the Cherubim, art Lord of the Seraphim and King of Israel, Thou alone art holy and restest in the saints. I implore Thee, therefore, Who alone art good and inclined to listen: Look upon me, Thy sinful and unprofitable servant, and purge my soul and heart of a wicked conscience, and, by the power of Thy Holy Spirit, enable me, who am clothed with the grace of the priesthood, to stand before this Thy Holy Table, and to perform the sacred Mystery of Thy holy and immaculate Body and precious Blood. For unto Thee do I draw nigh, bowing my neck, and I pray Thee: Turn not Thy countenance away from me, neither cast me out from among Thy children, but vouchsafe that these gifts be offered unto Thee by me, Thy sinful and unworthy servant: For Thou art He that offereth and is offered, that accepteth and is distributed, O Christ our God, and unto Thee do we send up glory, together with Thine unoriginate Father, and Thy Most holy and good and life-creating Spirit, now and ever and unto the ages of ages." The prayer is clearly intended to help the priest prepare himself spiritually for the more sacred moments of the Liturgy that he is about to perform. "O Lord our God, remember us, Thy sinful and unprofitable servants, when we call upon Thy holy, venerable name, and turn us not away in shame from the expectation of Thy mercy; but grant us, O Lord, all our petitions, which are unto salvation, and vouchsafe us to love and fear Thee with our whole heart, and to do Thy will in all things." "In our Liturgy, that which is most precious, most holy, is veiled. The altar is covered by an iconostasis, which has for its purpose, ironically, the uniting of the two areas of the Church. The iconostasis is the opposite of a barrier. Far from cutting us off from what is behind it, it mystically brings us into the very presence of the altar. Likewise, some prayers are covered from our ears because of their preciousness to God. While the choir sings during the anaphora, "the bishop first saith secretly the Prayer of invocation, then three times the prayer of the Third Hour... These are indeed the most solemn moments of the spiritual worship in the services of the Eastern Orthodox Church" [Bishop Theophilus, A Short History of the Christian Church and the Ritual of the Eastern of the Orthodox Church, (San Francisco: Douglass Brothers, 1934), p. 46] Thus, the anaphora certainly qualifies as a time to be covered in the mystical silence of unknowing, so that our sensual conduits of information do not obstruct the noetic apprehension of the incorporeal truths expressed by the Divine Sacrifice (The Celebrant: Priest or Pastor. An Investigation of the Mystical Prayers of the Divine Services of the Holy Catholic and Apostolic Church, Orthodox Life 46/4 (1996), p. 29). While I would acknowledge that there are many sincere and pious people who today argue in favor of saying these prayers aloud, in additional to all that has been said, I would say in response to the arguments regarding the great benefits that allegedly accrue to the laity when these prayers are said in their hearing, that there is no sign of a spiritual revival in those Churches that have begun to do so. In fact, if you look at what post-Vatican II liturgical reform has done to the Roman Catholic Church, I would say that the evidence is quite to the contrary. It is the spirit of modernism that is behind these pushes for the "renovation" of our services, and this is a spirit alien to the Christian Faith. Depending on your age, you might recall the TV show from the 70's called "The Six Million Dollar Man." The basic setting of this show was that a very athletic astronaut (Lee Majors) is seriously injured in an accident, so much so that military scientists reconstruct his body using super duper high tech bionic parts -- which make him better than he was before his accident. He can now leap over tall buildings in a single bound! He's faster than a speeding bullet! More powerful than a locomotive! Each show began with an intro that showed his accident, the scientists and doctors working busily to save him and then the lead scientist would say confidently "We can rebuild him. We have the technology. We can make him better than before." I first encountered religious bionics among my more liberal Protestant professors in college. Their attitude towards the Bible was the same as these scientists towards Lee Majors -- the Bible was a hideous historical accident of texts and views that happened to collide into one collection of books, but they had the technology. They could rebuild it. Not only that, but they could make it better than it has ever been. For thousands of years, no one had really understood the Bible -- but now these clever scholars had the knowledge to see the Bible for what it really was, and to reconstruct its real meaning. The Apostles might have been fooled. The Fathers of the Church might have been fooled. But not them! I first encountered this approach among the Orthodox when I read a book by an Orthodox Liturgical scholar who approached the Services just as my Protestant professors did the Bible -- it was deja vu, all over again. The services were a mess of haphazard layers of traditions -- most of which had lost their meaning because of the current shape and understanding that prevails in the Church today. In fact, no one had really understood the services for at least a thousand years or more -- and even before that, probably they didn't get it either. Only now that these clever scholars have arrived on the scene has their true meaning been unveiled because now "We have the technology. We can rebuilt it." I don't believe either the Scriptures or the Liturgical Tradition of the Church were formed in a haphazard manner. 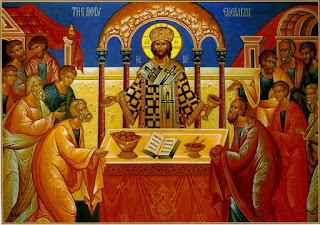 I believe the Holy Spirit inspired them, and guided their shaping into the form that the Church has handed down to us, and I do not believe it is possible that not only all of the Orthodox Church, but even all of Christendom could have fallen into error on a universal practice such as this. I would also recommend the book After Modernity... What? by Thomas Oden.